Have you ever been in an organisation where you were good at your job, efficient and productive, satisfied by what you achieved, hopeful about future prospects, respected in your expertise, and really feeling part of a good team? ……. and then all of a sudden, one day, out of the blue, you are told that some changes were going to happen; ……. and that a that a team of consultants were coming in to bring about these changes and introduce a new system (SAP, agile, lean………). This team then devotes time and energy explaining the purpose of the change, the why and how, and it all makes perfect logical sense, indeed the proposed changes are not dissimilar to changes you had proposed to your manager in the past. And yet, despite not disagreeing with the reasons for the change, your heart feels crushed, you somehow feel totally betrayed, utterly let down, completely undermined, leaving you shattered and dispirited. Why? Because nobody in the organisation, none of your superiors, ever bothered to ask you. The changes touch on the essence of your work, and still you were not even consulted. Instead someone at the top decided this was a good idea, let’s bring in some change experts in to implement it, and the team of consultants, who know nothing about the operational side of the work you do, are brought in to tell you what to do. Why aren’t you, as a long-time loyal employee, dedicated to achieving the aims of the organisation, being at least asked about the matter, never mind consulted? Obviously you feel disrespected and undermined, but also angry – your self-esteem is under attack. Suddenly this new system seems alien to you. While on reflection you would have been quite an enthusiastic proponent of the changes being proposed, because they were brought on over your head without your consent and without your views being heard, suddenly you feel estranged, and this new system appears alien. You lose motivation, you don’t want to be part of it, and you start silently resisting the change. Not because you disagree fundamentally or logically, but because of the manner this was done over your head. You were never given a say in the matter, nor a choice to opt in or out. You no longer feel respected and esteemed, you become cynical, and you, perhaps unconsciously, resist passively. Consequently you are now branded a change resister, and it is deemed you need to be “managed” with care. You are singled out as a laggard and for now ignored. It becomes a double blow, not only do you feel betrayed and undermined by the initial imposition, now you start losing confidence, your professional competence is called into question, you no longer feel part of the team, indeed resentment becomes stronger and stronger, you no longer want to listen, and a vicious cycle builds up. Suddenly you are a serious resister, an enemy of change, you are no longer for us but against “them”. While the consultants work on the more amenable employees, you become “the” problem, and your survival in the organisation becomes questionable, gradually instigating fear and a destructive atmosphere. And all because, initially, you were never asked. You were not invited to contribute to the new way forward, it was simply imposed on you from above. You feel alienated, because you were not invited to co-create the organisation’s future, and you no longer feel part of the team. Not consulting, not listening to, and not inviting those who do the work, those closest to the products/services and the users, and those most connected to the processes that create value, not bringing them in into the change process, not inviting them to co-create the change, are all prescriptions for failure. They reflect distrust and disrespect of an organisation’s own people. And yet this scenario happens again and again, person after person, time after time, organisation after organisation. What a waste of good resources! What a waste of energy! What a waste of great talent! The solution ‘should be’ fairly straight-forward, do exactly what’s missing: ASK! Invite the affected employees to co-create the change and thereby make it their own. Why don’t so many organisations follow this most basic of human leadership principles? Possibly a legacy of the command and control management attitudes of the last century? Possibly due to an inherent unconscious management distrust (and disrespect) of employees. Possibly due to lack of awareness of the inhumaneness of mandation, an unintended consequence of classical intervention. Possibly due to worries about having to “manage” large numbers of employees invited to co-create the change. And possibly simply, it has to be said, due to a lack of know-how – managers may know that engaging the workforce might be important, but they just don’t know how to go about it. The challenge is how to do it at scale. This is exactly the issue and the know-how a new book just silently published recently seeks to address. It is called The Open Space Agility Handbook. It is written and conceived by Daniel Mezick, respected senior agile coach in the Boston area, author of Culture Games, together with a team of experts, Mark Sheffield, Deborah Pontes, Louise Kold-Taylor, Harold Shinsato and OpenSpace Technology founder, Harrison Owen. ‘Agile’, for those of you not from the IT or software development world, is a working practice applied by software engineers, derived from ‘Lean’, which enables software development teams to be much closer to customers and to respond to their needs nimbly, thus being agile. The practice is anchored in the Agile Manifesto. 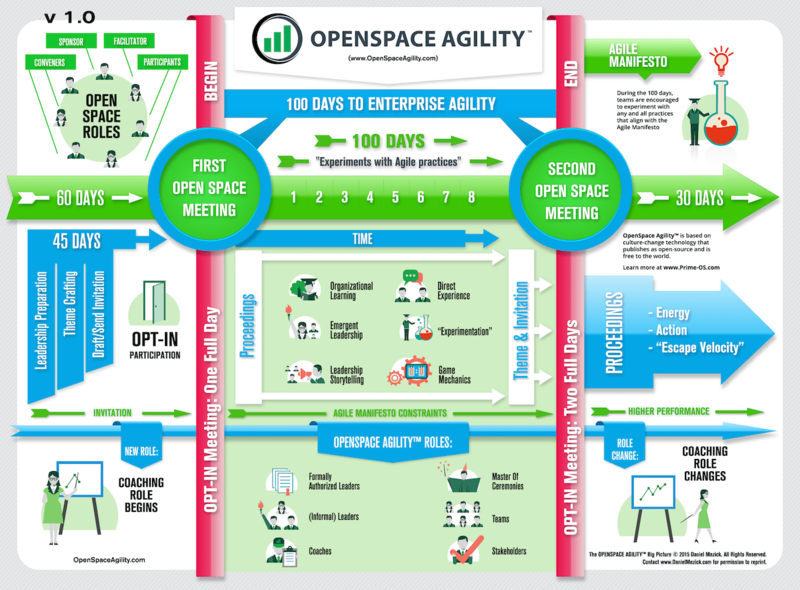 This diagram is copied directly from the Open Space Agility website. and represents an overview road map of OSA used in the book. While this new book focusses on ‘Agile’, it is really about organisational transformation. The title, The Open Space Agility Handbook, sounds pretty technical and unobtrusive. And in one sense that’s all it is, as the title says, it’s a handbook on how to adopt agile practices, using a double Open Space Technology frame. What the book’s title doesn’t betray, however, is the transformative power of its approach. On one hand the book is simply a step by step guide on implementing agile. On the other hand it presents a revolutionary approach to agile adoptions, and beyond, in fact it tackles head-on one of the key challenges of organisational interventions and change management itself. As innocuous as the book may seem, don’t be fooled by its simplicity. It describes a simple solution to one of the most difficult challenges of management, that of scaled organisational change. While the handbook concentrates on agile only, the principles and philosophy behind the invitation approach is applicable beyond agile – you can replace “agile” with “lean”, “conscious” or “responsive”. The approach could just as easily apply to lean, teal, responsive, peer-to-peer learning, distributed leadership, conscious business, environmental sustainability, beyond budgeting, sociocracy and indeed any other form of organisational transformation. Thus whether you like agile or not, if you are involved in adoptions, implementations or transformations, this book is for you. Instead of mandating change from above, which leads to resistance or internal sabotage, the approach urges organisations to ask and invite the relevant work-force to co-create the change together, as a collaborative iterative effort, rather than imposing from above. The approach is based asking those doing the work about proposed adoptions or change and inviting them to co-create transformation together, using a combination of Open Space Technology and standard coaching iterative methods, ….. and thereby avoiding the tremendous waste of talent and resources arising from the imposition of change. As the concepts of INVITATION (as opposed to directed or imposed), PEER-BASED SELF-ORGANISED LEARNING (SOLE) and CHANGE CO-CREATION become increasingly understood and appreciated in organisations, so this simple how-to book will find a growing audience in and beyond agile. The approach is completely in line with what the Stanford and London Business School guru Gary Hamel has termed the ‘change platform’. More details of the approach can be found here.